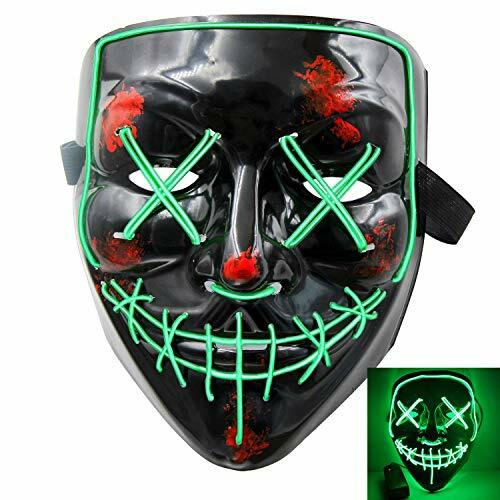 Halloween Scary Mask Cosplay Led Costume Mask 50% Off with Code! Unique Fashion Mask Color: 4 colors. The mask control have 4 modes: Steady Light,Slow flash,Fast flash,Off. Unique Fashion Mask,Comfortable, Comfortable, padded fit conforms to the curves of your face. Clip the power pack to your pocket or onto your clothing. Takes two AA batteries (not included). Perfect gift: Perfect for Halloween, Costume Parties, Masquerades, Mardi Gras, Rave Festivals, Carnivals, Gifts, Birthday and Events Note : that all glow wire battery packs in the industry make a slight high pitched tone and this is normal. For this reason, we've found that it is best to place the battery pack in your pants/shorts pocket to muffle the sound.